Rodda’s was one of the very first food producers to support the Royal Cornwall Show back in the 1960s. Nicholas Rodda, managing director and fifth-generation of Rodda’s, celebrates at this year’s Show with his father, Alfred Rodda, and his sons William Rodda, Alexander Rodda and Edward Rodda. Rodda’s Cornish Clotted Cream is one of the official sponsors of The Prince’s Countryside Parade at the Royal Cornwall Show today (June 7). The Prince’s Countryside Parade will provide an opportunity to celebrate HRH The Prince of Wales’s contribution to the countryside, environment and rural communities in the UK, coinciding with a programme of activity to mark HRH’s 70th birthday with 70 charities planning to take part from around the UK. Nicholas Rodda, managing director and fifth generation of Rodda’s, said: “We are extremely proud to be at the heart of these celebrations at The Royal Cornwall Show this year. “Our family business started 128 years ago, when my great great-grandmother Eliza Jane Rodda began making clotted cream in her Cornish farmhouse kitchen. Today, we craft our Cornish Clotted Cream in the very same way, through cherished family recipes and time-honoured traditions. 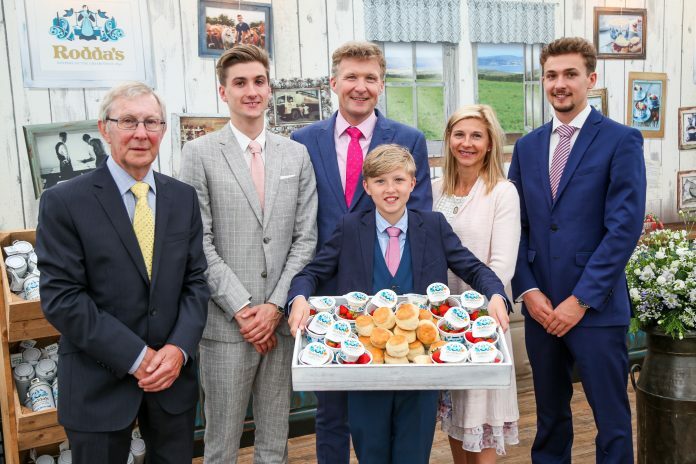 To coincide with the event and to mark HRH The Prince of Wales’s 70th Birthday, Rodda’s is giving away 70 Cream Tea boxes each day at 1pm at its stand in the Food and Farming Pavilion.